What will become of Jas and Marcus? Has the Guerrilla TV show been cancelled or renewed for a second season on Showtime? The television vulture is watching all the latest cancellation and renewal news, so this page is the place to track the status of Guerrilla season two. Bookmark it, or subscribe for the latest updates. Remember, the television vulture is watching your shows. Are you? A love story on the Showtime premium cable channel, Guerrilla stars Freida Pinto, Babou Ceesay, Idris Elba, Rory Kinnear, Patrick Gibson, Nathaniel Martello-White, Daniel Mays, Denise Gough, Brandon Scott, Zawe Ashton, Bella Dayne, Wunmi Mosaku, and Nicholas Pinnock. The political drama takes place in racially charged 1970s London. It centers on Jas Mitra (Pinto) and Marcus Hill (Ceesay), a politically active couple and the rise of the British Black Panther movement. The first season of Guerrilla averaged a 0.02 rating in the 18-49 demographic and 102,000 viewers. Learn how Guerrilla stacks up against other Showtime TV shows. As of April 21, 2019, Guerrilla has not been cancelled or renewed for a second season. Stay tuned for further updates. Guerrilla had a very poor start in the ratings. Although premium cable channels aren’t ad dependent (since they count on paid subscribers), they must still run programming that people want to watch. Guerrilla is billed a “limited event series” so it theoretically could score a season two renewal . However, with such low numbers, I sincerely doubt it will. Subscribe for free updates on any Guerrilla cancellation or renewal news. Find more Guerrilla TV series news or other Showtime TV show news. What do you think? Do you hope the Guerrilla TV show will be renewed for a second season? How would you feel if Showtime cancelled this TV series, instead? 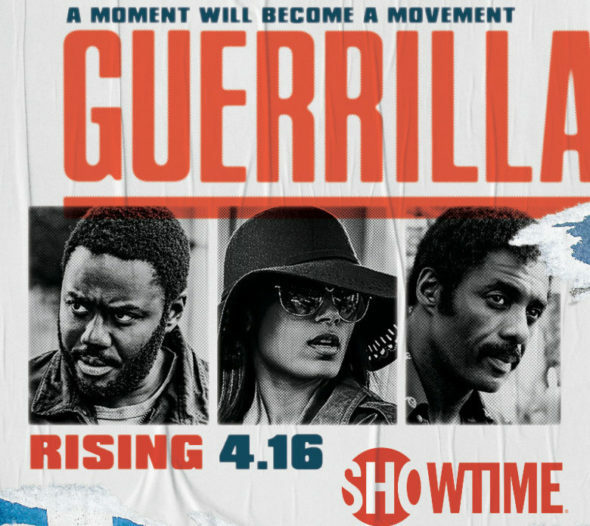 More about: Guerrilla, Guerrilla: canceled or renewed?, Guerrilla: ratings, Showtime TV shows: canceled or renewed? White Famous: Cancelled or Renewed for Season Two on Showtime? Ray Donovan: Cancelled or Renewed for Season Six on Showtime? Homeland: Cancelled or Renewed for Season Seven on Showtime? The show is very slow and a bit inaccurate to history. I love Idris but I can’t force myself to watch another season. It kept getting worse. Please, don’t cancel this show. Very selfish of me but Homeland is the only other show I watch. Guerilla has a terrific grip on reality. However, I can totally understand why many White Americans might not like it. I enjoyed it very much. I hope for a second season. It’s a no for me. Please no second season … Id rather watch billions. The ratings make a lot of sense given what I watched, really bland show! I also see what the upset is about. The casting or lack thereof is somewhat disturbing. Definitely not worth another watch. Cancel it. Great series. Got better with every episode. Plenty of scope for a second series. Would love to see a second series. Series 1 got better with every episode.